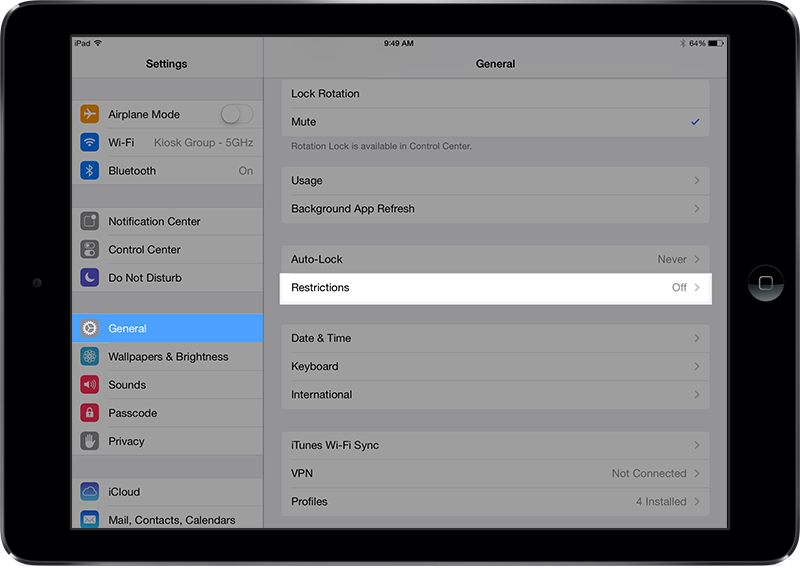 The Restrictions section in the iPad's general settings let you control the features and content available on the iPad. This can be helpful if you're using Kiosk Pro in an unsupervised setting, where others may be able to access more than just the Kiosk Pro app. We generally recommend restricting any unnecessary apps as well as purchases through the App Store. Open the iPad Settings and select General in the sidebar, then select Restrictions. When prompted, set a passcode, then confirm it. 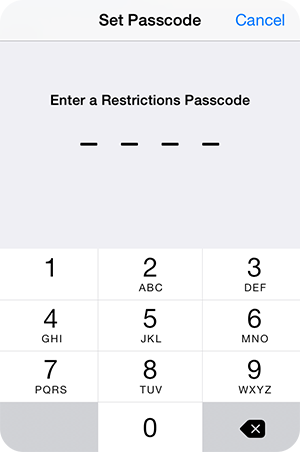 To disable Restrictions, navigate back to this menu (you will need to enter your passcode upon selecting Restrictions), select Disable Restrictions, then enter your passcode a final time. If you choose to enable Restrictions, please consider that you or someone at your organization may need to disable Restrictions in the future to update the app or make other changes on the device. Recording the restrictions passcode - either on the back of the device on a piece of tape (if you are using an enclosure that covers the back of the device) or in another secure location - can save headaches down the road. Turning off Restrictions without the passcode requires a factory restore of the device, which means you will have to redownload any apps installed and any app data, including settings, would be lost. You can find additional information about Restrictions on Apple's site.